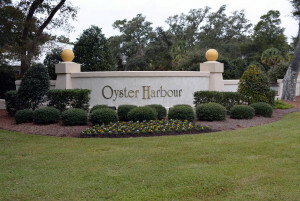 Oyster Harbour, one of Brunswick County’s up-and-coming communities has much to offer. This gated community of around 500 home sites offers its owners a boat ramp on the Intracoastal Waterway and day dock for boats as well as a quaint children’s park shaded by age-old live oaks. No need to fret over parking your boat at your home; the community offers its own boat storage area as well. Within the gate, you’ll find tennis courts, a clubhouse and swimming pool. Walking trails wind through the community with gazebos and meditation spots. Nine natural and manmade lakes and ponds provide water and marsh views for many of the homesites. Those along Russell Hewett Dr have a much coveted view of the Little Shallotte River. However, you’ll enjoy the natural beauty that abounds in this area on any homesite you choose. This location allows you to enjoy the best of coastal Carolina living, everything within minutes of your home. Shallotte is just minutes away with shopping, dining and professional services. You can be in historic Southport or Wilmington in 45 minutes and enjoy all that port towns have to offer. Forty minutes south will take you to Myrtle Beach, the entertainment capital of our area. And of course, a day at the beach is only 15 minutes away. The choice to live in Oyster Harbour will bring you many happy days filled with beauty, fun and excitement! But you’ll need a key to get through the gate. Give us a call and we will be glad to give you a tour.